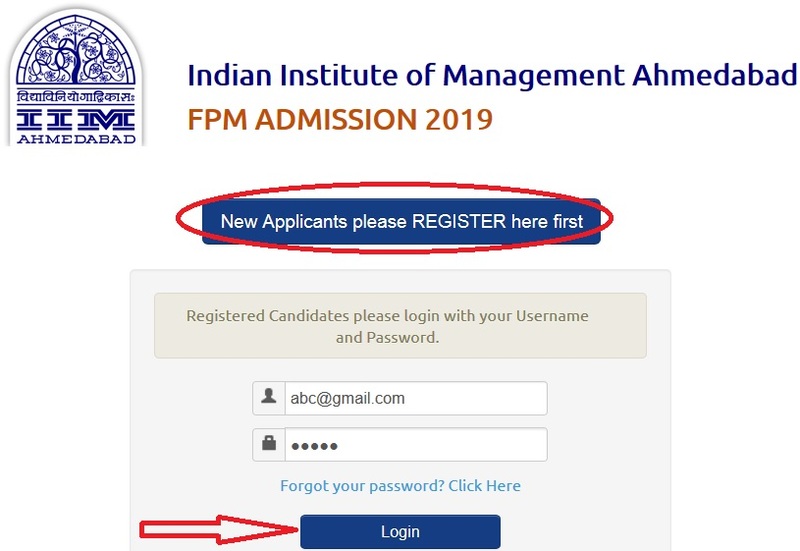 Online Application for FPM batch (2019) is now open. The Fellow Programme in Management (FPM) is the doctoral programme of IIMA. FPM admits students who have a strong academic background, are highly motivated and who have the intellectual curiosity to undertake original research. 4. A 4-year/8-semester Bachelor’s degree with at least 60 percent marks or equivalent grade point average. Application Form and Brochure are available online. Candidates can fill-up the application form online. Step 1 : Go to the official website of IIM Ahmedabad provided above. Step 2 : Read the instructions carefully and click on the “Apply” link at the end of the page. Step 3 : Then Click on “New Applicants please REGISTER here first” button. Step 4 : Fill in all required details and submit to register. Step 5 : Once registered, the applicants will registration and login details on their email. Step 6 : Login again to complete the application. Step 7 : Read all the instructions carefully. Step 8 : Fill in all necessary details. Step 9 : Upload supporting documents. Step 10 : Pay the application fee of INR 500 through IIMA gateway. Step 11 : Finally, submit the application. The fellowship covers all academic expenses like tuition, computer, library. placement, alumni fees and medical insurance. ** Subsistence allowance of INR 32,800 per month (for first and second years), INR 35,400 per month (after the completion of comprehensive examination) and INR 39,300 per month (after the submission of TAC approved thesis proposal). ** Contingency allowance of INR 25,000 per annum for 5 years covering research expenses, photocopying expenses, expenses on books, etc. ** A maximum amount of INR 1,75,000 for attending international workshops/summer school/conferences during the fellowship programme. Candidates applying to the Fellow Programme in Management are required to take the Common Admission Test (CAT) or a standard test in lieu of CAT. For NRIs and Foreign students this standard test is the Graduate Management Aptitude Test (GMAT). The last date for submitting the application will be January 24, 2019.